Interested in bringing a show and/or hosting your own bespoke event or conference at the Riverside Theatre? Our staff would love to hear from you! How much does it cost to book the Theatre? It currently costs £300 per performance plus 15% of the box office for amateur, educational and charity groups and £500 per performance plus 10% of the box office for professionals. Sometimes we will offer a split of box office if we think your project both helps us to deliver our objectives and will be well supported by audiences. Rehearsal days can be negotiated on the basis of a per hour cost. But please don't regard the above quotations as final. They are guidelines. We can tailor an event for you, specifically to your requirements and specifications, and can then give you the best possible, advance quotation for your budget. Please contact the Riverside’s manager: r.sturgeon@ulster.ac.uk or fill in the form below. Whether it’s a hire or a split, Riverside will provide the services of a technician (by arrangement), the Theatre will sell tickets both online and via its box office and the Operations Department will look after the audience, the bar and the shop during performances. The Theatre will advise and assist you. Riverside may, at its own discretion, include your event in the twice-yearly brochure and on the website. We would expect all groups to supply us with an agreed number of posters and fliers in accordance with the nature of the event you are holding. (Not necessary for conferences). We plan a minimum of one year ahead but it is sometimes possible to fit in additional events at much shorter notice – so do please check with us. How many can there be in the audience? 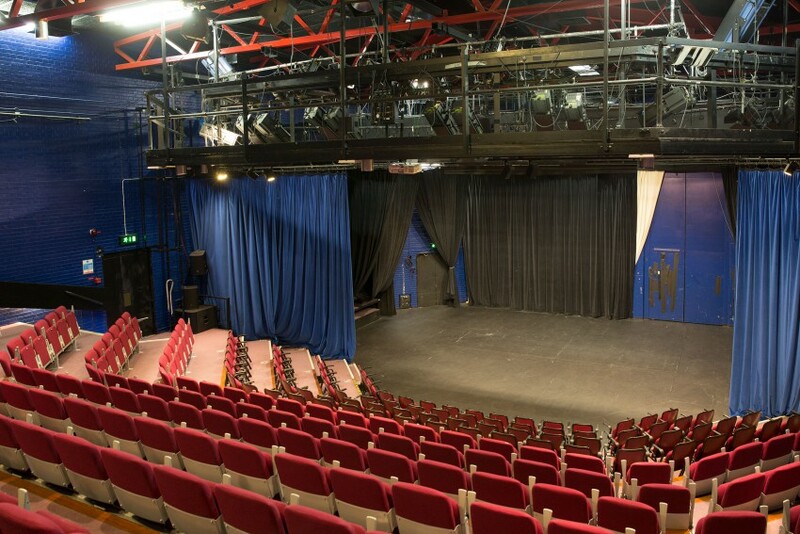 Riverside is one of only a tiny number of theatres with a variable auditorium. Playing “end on”, the capacity is 270. If your event can be performed with the audience on three sides, this increases to 360. These vary from about £7 through to £25, depending on the show. If you’re hiring the Theatre or if you have negotiated a share of the box office, you can negotiate ticket prices in consultation with Theatre management. 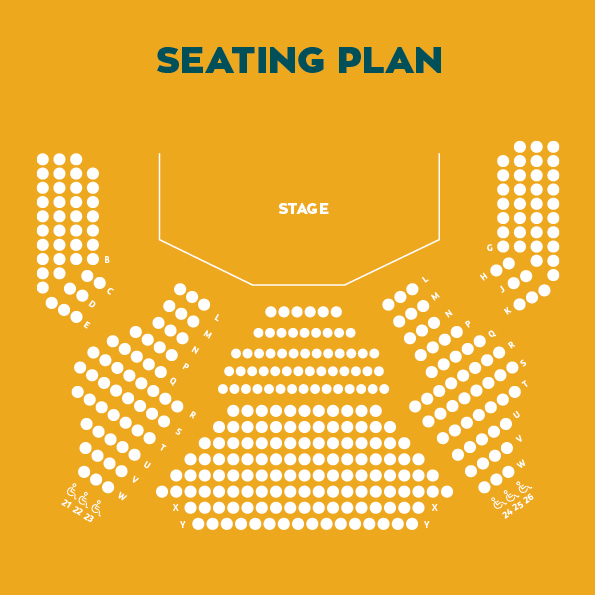 The Riverside is unique, in a Northern Ireland context, by having both a totally variable stage and seating facility. It can offer facilities for traditional proscenium arch (i.e. “end-on”, the traditional theatre style) and also for thrust (where the audience is seated on three sides around a horseshoe-shaped performance area, bordered by a two-foot deep moat). It can also facilitate an orchestra pit, in the centre of the auditorium, for up to twenty players. Overall, Riverside's main auditorium can be configured and used in up to six different ways - hence our claim to uniqueness in an NI context. 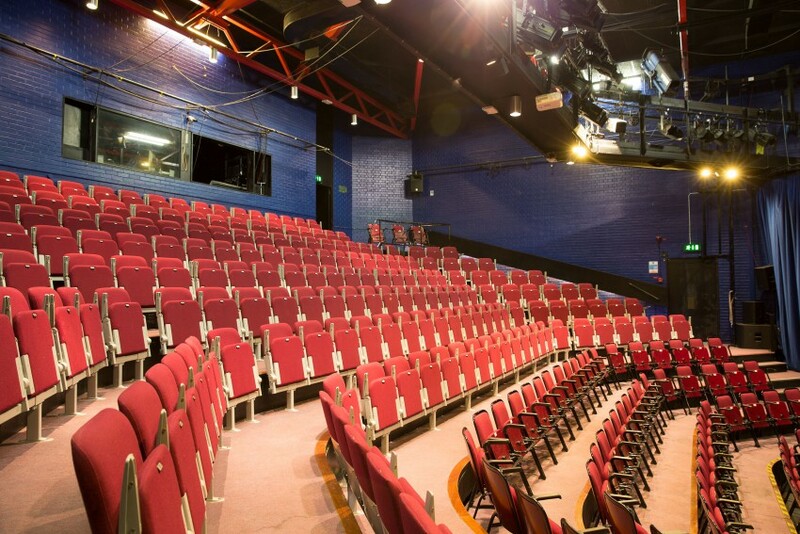 In proscenium arch format Riverside can accommodate 290 seats: in thrust, this increases to 360. Both formats include special designated areas for wheelchair users.